Whilst looking around the museum in Bristol, I saw these ancient carving tools on display and thought it might be nice to share them with you. The tools were bought by the museum in 1919 from a Captain E.A. Mackay. The metal is a copper alloy, which makes the carving achievements of those ancient craftsmen seem all the more amazing as the copper alloy is softer than the steel used in modern tools. Other elements used in ancient copper alloys included antimony and arsenic. Arsenic often occurs naturally in copper ore, so may have been the original alloying material with copper to make bronze. Eventually it was superseded by the use of tin, as tin was easier to add in specific amounts and was non-toxic . It wasn’t until the time of the last pharaohs, long after these objects were used, that Egyptians began to use iron for this purpose. The chisel with a wooden handle seems very similar in size and shape to a modern palm chisel and was probably used for detailed work without a mallet. It is thought to date to between 3,300 and 3,600 years ago, what was the eighteenth dynasty of the New Kingdom. The awl in front of it (a spike used for making small holes) is thought to date to the same period. The larger chisel in the holder to the right would have been used with a mallet. It is believed to be older, from the twelfth dynasty of the Middle Kingdom about 3,800 to 4,000 years ago. 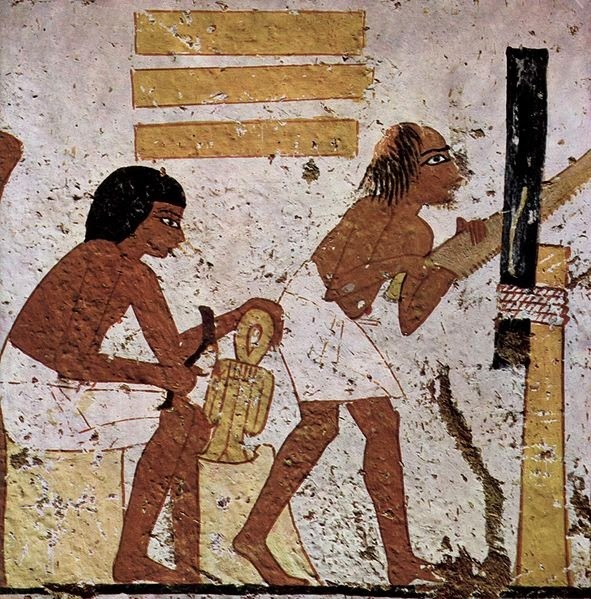 Ancient Egyptian images of woodworkers show them using many tools that woodworkers into the medieval ages of Europe were still using variations of. 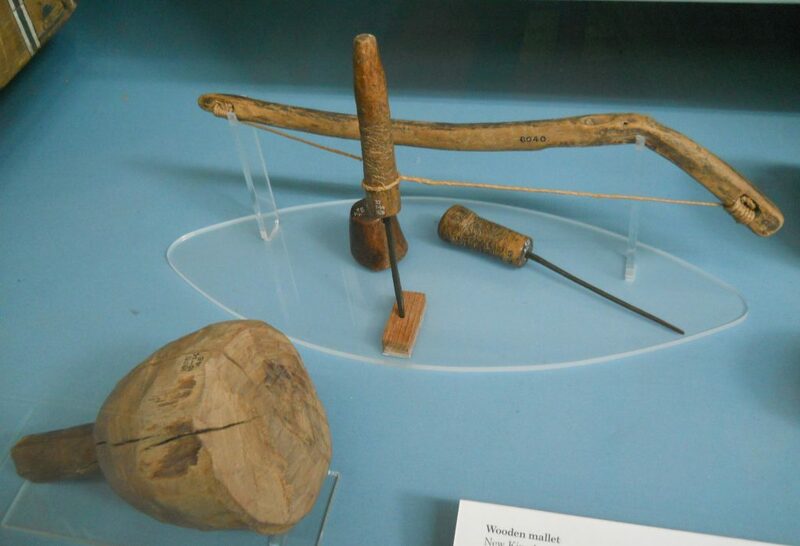 Axes and saws were used to roughly shape the wood into planks and blocks, adzes shaped it further, awls and bow drills were used to make holes and chisels and mallets were used for fine work. Much of the timber used was probably imported from what is now eastern Africa and the Lebanon, as Egypt did not have large forests at that time. Nearby, there are examples of stone carving tools. The mallets certainly look familiar; I have a couple very like them in my own studio! The caption on the display speculates that the worn one may have been buried with a carver in the belief that, although it was worn out in this world, it would be perfect again in the next. They are thought to date to the third dynasty of the Old Kingdom, between 4,620 and 4,700 years ago according to the museum caption. The stones on the shelf would be used for grinding down stone sculptures to smooth them. The copper alloy chisel in front of them dates to the eighteenth dynasty of the New Kingdom, between 3,300 and 3,600 years ago. It would have been used to shape stone, with a more rounded, bar-like shape of chisel used afterwards to smooth the sculpture. There are more tools on display at the British Museum in London. The information used here comes from the labels with each exhibit. King Djer reigned during the First Dynasty, about 5,100 to 4,900 years ago. His tomb is surrounded by the remains of over 300 people; his wives, guards and servants. They must have committed suicide or been killed at the time of the king’s entombment, to serve him in the afterlife. One retainer was called ‘Hem’, meaning simply ‘servant’. He was a craftsman and was interred with two copper chisels, a copper adze head and the tool on the right, which is thought to have been used to cut leather. The copper axe head on the left was one of several found with other bodies. It was a high-status possession and these people were probably special guards. This axe head is inscribed, including with an elephant design, but no one knows what the inscription means. King Khasekhemwy ruled during the Second Dynasty, about 4,904 to 4,700 years ago. He was keen on construction and developments in such things as large-scale use of dressed stone during his reign led the way for the later building of the Pyramids. 194 thin copper models of tools were found underneath a collapsed wall in his tomb. They include models of chisels, harpoons, adzes and needles. Many are in groups of eight, possibly reflecting the Egyptian working week of eight days according to the label. I wonder why they are models and not genuine tools? The New Kingdom dated from about 3,564 to 3,084 years ago. Below is shown a wooden mallet from this time, found at Thebes. See the similarities between the shape of this one and the much older ones shown in the Bristol Museum display above. The bow-drill found at Deir el-Bahri exhibited next to it uses bronze bits to drill holes. The end of the wooden bit holder would be steadied inside a hollow cut into the conical wooden piece displayed behind the drill. The bow would then be moved back-and-forth to spin the drill bit. The tools shown next come from different periods. The chisel with its wooden handle dates, like the saw immediately below it, to the New Kingdom in Thebes. They use bronze blades, like the pull-saw at the bottom which came from Deir el-Bahri and dates to the 18th Dynasty about 3,600 to 3,300 years ago. The two bronze-bladed adzes also date to the 18th Dynasty. The one on the left is from Thebes during the reign of Tuthmosis III which was about 3,493 to 3,439 years ago. The one on the right was found at Deir el-Bahri and was used during Hatshepsut’s reign 3,493 to 3,471 years ago. This adze still has the original leather thongs holding the blade on. Its wooden handle is carved with a hieroglyphic inscription. Compare these tools to the image of the workers using an adze and a saw shown above. These damaged corners from coffins show how joints would also be strengthened using dowels or cramps, made from a close-grained wood such as sidder. The sidder wood cramp top right in the photo above dates to the 17th or early 18th Dynasty, 3,600 to 3,500 years ago. It is inscribed with the name ‘Ameny’; maybe the name of the cramp’s maker or its user, in a similar way that modern workers in busy workshops or building sites write their names on their tools to stop them ‘going for a walk’. The coffin boards on the left comes from Asyut during the 12th Dynasty, about 3,950 years ago. They have been joined with such cramps. The dowelled joint on the right is from the same location and period as the cramp-joined boards and has some dowels from the Middle Kingdom (4025-3,630 years ago) displayed below it. What timbers did ancient Egyptian craftspeople use? It can be hard to tell from the names that they gave them, but scientists have analysed woods under the microscope and worked out what many of them are from their cellular structures. They are generally associated with things made for funerals, as these have been preserved in tombs. The main local timbers used were sycomore fig (Ficus sycomorus), tamarisk (Tamarix sp.) and Nile acacia. To make coffins and the like, carpenters would need longer, straighter boards and these were obtained by trade, mainly with the area now known as the Levant. Coniferous softwoods such as cedar as well as juniper and cypress were bought and used. Cedar was especially reserved for the coffins of high-ranking people, although different parts of a coffin could use different timbers, depending on their suitability for different purposes. You can find out more, including some ancient Egyptian names for different timbers, at the digitalegypt website. There are some more images of ancient Egyptian woodworking tools on this post by Marijn, of the St Thomas Guild: follow this link. There is also an illustrated history of the development of the saw online here. Finally, I had to include my favourite piece of ancient Egyptian woodcarving. It is a statue of a priest who would have said prayers for the dead. His name was Ka’aper. He lived during the fifth dynasty of the Old Kingdom. Dating this period seems quite difficult, but it is somewhere between 4,686 and 4,520 years ago. The people who excavated the carving, at Saqqara, thought that the statue looked like the chief of their village so they called it ‘Sheikh el-Balad’ which means ‘village chief’. The statue is 112 cm (about 3′ 8″) tall and is carved from sycamore wood (I’m assuming that this refers to sycomore fig (F. sycomorus)). The eyes were made to look ‘alive’ by using a copper lining with white quartz and a central disc of rock crystal. People in other parts of the world use similar optical tricks on their carved statues. 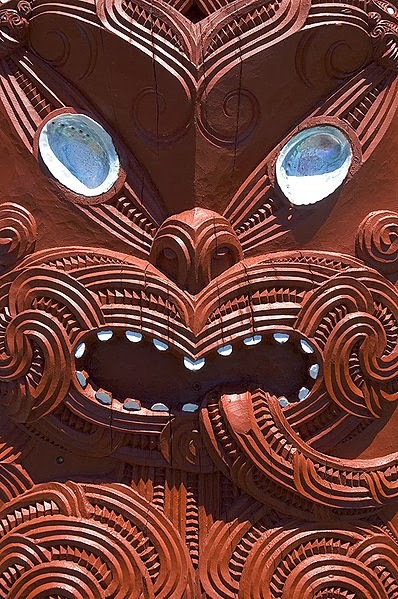 For example, in New Zealand traditional Maori woodcarvings have inlaid paua (abalone) shell eyes that twinkle in firelight to look like they are watching.